Thinking about Luke Beesley’s poetry perhaps requires some understanding of his writing process, since the poems themselves often engage with the difficult business of creativity, or the ‘square task of art’, as Beesley terms it (‘A Tusk’s Chalking Innocence Against Evening’, 60). In Beesley’s work it seems true that how he writes – i.e. his technique, routine, tools, etc. – informs and is in itself a meaningful aspect of what he writes. Collated from pencil-sketched drafts of quick-writing, his poems have a way of seeming to enter the world at an angle, coming in crosswise; they gesture broadly in the direction of reality, which is always a moving target. Reading Jam Sticky Vision produces a sort of house-of-mirrors effect, in which the sensory world is reflected back at the reader in its full vibrancy but, simultaneously, returning distended, canted a little to the side: ‘I had a cup of coffee in a small cup, and time asleep was a dream hidden’ (‘How Will I Know When I’m Home?’, 71). Stylistically his work pays particular homage to the New York School poets, like John Ashbery, Frank O’Hara, and Kenneth Koch – in fact, Beesley’s poem ‘The Australian Double’ receives its title from a line in John Ashbery’s collection Quick Question (Ecco Press, 2012) and the poem ‘Coda’ references Koch in its opening: ‘So I wait here reading Koch drinking in the morning checking the spelling’ (54). Certainly, Luke Beesley isn’t shy about telling you whom he likes, and the references and allusions to these influences are made with genuine affection, without a drip of Bloomian anxiety. Throughout the collection, and particularly in the excellent closing suite, ‘How Will I Know When I’m Home?’ (61-72), the excessive energy of the absurd is witnessed creeping its tendrils into the less colourful, though no less meaningful, ordinary world of bedrooms, train stations, and kitchen sinks. In this last poem, written during Beesley’s residency at the Wheeler Centre, Jam Sticky Vision’s compounding of images arrive at their most intimate and vibrant timbre, seeming to suggest that, in the immediate reality of our present times, the absurd and the day-to-day are not in competition, but wholly one and the same: ‘There was no leaving the house. The house was there. It wasn’t immobile, wholly, but an address beyond pencils and creamy duck-feathered coloured paper’ (63). Even though so many of its cultural debts are American (n.b. 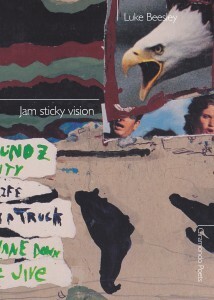 the bald eagle seen swooping in from the top-right corner of the cover image) Jam Sticky Vision still feels like a distinctly Melburnian collection – stylish, witty, erudite, contemporary, but also personal and close to what one might call home. Ultimately, the collection offers readers a visually rich spread of poetry, comprising a hyperreal blend of ekphrasis, absurdist imagery, anecdote, and autobiography, which somehow manages to be as entertaining as it is challenging and profound. Reviewing it has been a joy. This entry was posted in BOOK REVIEWS and tagged luke beesley, Nick Xuereb. Bookmark the permalink.